﻿ Mobile Monday Global - 10th Anniversary - Congrats! 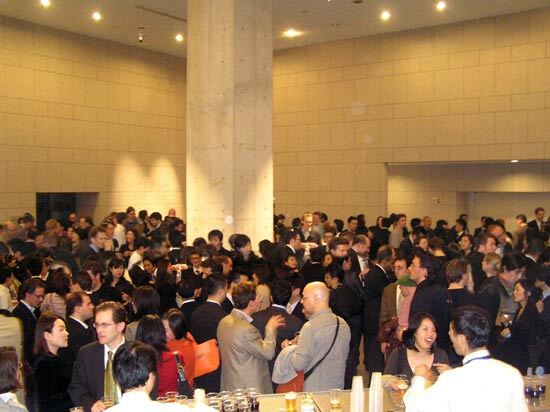 Mobile Monday Global – 10th Anniversary – Congrats! This month marks the 10th Anniversary of the very first MobileMonday meeting, held in Helsinki on Sept. 4th 2000, and we wanted to take a quick moment here to pay our respects for the many blessings over the years while looking forward to another decade of Bringing the Mobile Community Together! Vesku and Peter clearly had no idea at the time, but MoMo has since become a global platform for countless valuable connections. Growing from mid-2004 with Tokyo as the first location outside it’s native Finland, to well over 100 chapter cities in 50+ countries to-date, we have come a long way since their historic founding night in Molly Malones. Reflecting now on what best goes into this tribute, it occurs to us that words do not adequately describe the meaning of MoMo. Of course there is plenty of boiler-plate material with clear mission statements, supported by tons of online content generated via our combined activities stretching from Adelaide to Zurich, but ultimately the real story comes from actual participation. While nobody is really keeping track; the last time chapter organizers tried to make an educated guess, in mid-2008, the total number of physical events held was already well over 1,000 worldwide! Thinking about the industry we are in – Communications – and the explosive growth of wireless over these last few years, one point remains constant. While we can, and indeed are, doing ever more thanks to mobile networks and devices; people connect best in a face to face environment. Whether to learn from a presentation, by an introduction of a colleague or bumping into a new contact, MoMo has long-served as ‘the place’ to gain insight and meet great people, while – Smile! – hopefully having a little fun too. We have been asked many times along the way to describe individual ‘success stories’ as proof of the tangible results coming from all of these efforts. To be sure, there are many more than could ever be easily documented. Consider the mid-2008 founders survey which estimated approx. 100,000 members in the global database and simple math to multiply that by 1,000 events – keeping in mind that was over two years ago – it’s quite likely there have been at least 1 Million handshakes at MoMo to-date..!!! At any rate, countless discussions with new potential customers, vendors and partner networks have started as a direct result of MobileMonday, that is the success story we can tell without fear or favor. The best stories of our merit should come from the many fine people who have attended, in their own words. For us here at Mobikyo, both personally and professionally, MoMo has been a fantastic vehicle. We have made literally hundreds of new friends for life and traveled to events around the world with demonstrated client work as the direct result of raising our profile via the MoMo network. It’s been a real effort to run just over 50 events in Tokyo in the last six-years but we have had plenty of fun and we are most grateful to the So Many people who have helped us make it happen along the way. Looking forward to 2020, we have measured confidence this phenomenon will just keep growing and contributing for the mutual benefit of all members. Based on the platform in place along with increasing support from key players in various sectors, who are now finally beginning to embrace the needs and opportunities of this industry, we are excited to continue with this worthy cause. We are headed to Finland and Estonia for the MoMo Summit at the end of September and will pass along our very best regards on behalf of the some 4,000 MoMo Tokyo members. There will be plenty of interesting folks on-hand and maybe ‘several chances’ to raise a frosty pint celebrating the MAGIC of MoMo = Making A Great International Community.